An Alliance Party councillor has accused Sinn Fein of “cheap party political point scoring” and “hypocrisy” after one of its activists publicly criticised two DUP representatives for welcoming EU funding for their local area. “The £151,000 for this programme in this council area comes from the EU and is managed by the Special EU Programmes Body,” Mr Duffy said. “Two DUP councillors on Lisburn and Castlereagh Council have welcomed today’s announcement and the availability of the funding. This is bare faced hypocrisy of the highest order from the DUP. “This is the same party that is hell bent on doing their best to drag us out of Europe against the wishes of the majority of people in the north of Ireland. 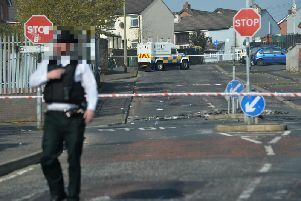 “Mr Duffy would do better to read up on what Peace IV is actually delivering in Lisburn North rather than stretching the reality of the situation to fit his own political agenda,” the Alliance representative said. “Sinn Fein shouldn’t be trying to detract from the good work of the partnership with cheap party political point scoring when it has always operated well on a cross party consensus basis.